The Boneyard and All Natural Pet Delivery will host a fundraiser in honor on the inaugural K-9 Veterans Day on Saturday March 10, 2012 from 6pm to 9pm. The goal is to raise money for the US Military K-9 Fund, established to support our military working dogs deployed with our troops to the Middle East and other overseas locations. The actual date for the first K-9 Veterans Day will be March 13th. It has been set up in remembrance of all the working dogs who have risked their lives at the sides of soldiers beginning in World War II, right up through the present day. In fact, there are now more K-9 soldiers than ever before. dog. She will be on hand at The Boneyard on March 10th to celebrate her new holiday. 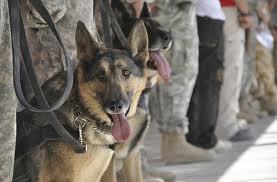 they do for the military working dogs is their own project. goggles for dogs. These goggles provide them protection from the sun and sand. regulating their body temperature. They can experience heat exhaustion faster than a human. them from sniffing out caches of buried or hidden weapons and ammunition. use helping military working dogs around the world. more than 250 boxes to places as far as South Korea, Japan, Iraq and Afghanistan. with fund-raising for the US Military K-9 Fund.